Many animal species have specific behaviors which occur in a group throughout generations, also known as animal cultures. These behaviors are taught to the young in a group by mimicking the actions of the older, more experienced individuals. With population decline, there is a loss in genetic diversity and there is a risk to animal cultures if the older individuals in a population are removed. A popular method to help animal culture is to introduce specific behaviors through early life training. A group including CEID member Claire Teitelbaum, studied whooping cranes that received early life training to see if the behaviors continued throughout their life. While previous work has employed early life training to increase survival rates for reintroduced species, it is rare for studies to track individuals for an extended period after release. To determine if behaviors learned through early life training last, Teitelbaum’s team studied whooping cranes migratory flight patterns that received two different early life training methods. One received aircraft training which taught them to follow an ultralight aircraft to their grounds for the winter. The second method had conspecific trained cranes follow other birds on their first southward migration. They gathered information on 602 overwintering locations of 158 individuals over 11 winters. As time went by the cranes were more likely to stop farther north. Conspecific trained birds stopped farther north earlier than aircraft trained birds, but as time went by the stopping points became closer and closer, until the age of six where the two groups stopping grounds were no longer separate and merged into one. 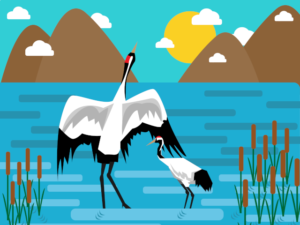 Teitelbaum and her team concluded that early life experience is significant especially in the first few years of life, but as the cranes moved into adulthood, environmental circumstances and behavioral changes had a stronger effect on their migration distance. The researchers anticipate that introducing multiple behaviors can provide a broader variation in behaviors and animals adopting the most beneficial behaviors will lead to more successful reintroductions of self-sustaining populations. There is still more to learn about the long-term effects of early learning experiences on animal behaviors and how learned behaviors can impact the reintroduction of different animal species.